A few months ago my friend R asked me if I would like to volunteer with her at the Avon Walk for Breast Cancer in Boston. R has walked the past 5 years and wanted to take a break but still wanted to be involved. She told me she would do as much or as little as I wanted to do and we agreed that we would volunteer for set up of Closing Ceremony. I had volunteered in NYC a few years back with my best friend La. She was working the pharmacy tent at the Wellness Village and I went along to help her dispense meds. I remember being in awe back then by what I saw and felt and hoped that one day I would be able to participate in some way again, today was the day. R and I got to UMASS Boston at 7:45 AM and worked with the rest of the volunteers to get the site ready for the walkers to cross the finish line. During a bit of a lull in set up, this woman dressed in pink came out of nowhere. She approached me (I was in the middle of the small crowd of volunteers) and touched my shoulder. She was a crew member and asked if she could get her t-shirt early because she had to catch a flight back to Orlando. I told her that that I wasn't sure and that she should ask the woman in charge and I pointed her out. She then stopped, looked deep into my eyes and pulled a pink sash out of her pocket. She said very quietly, will you please wear this for me? I told her yes, she placed it over my head, gave me a squeeze (I felt a chill) smiled at me and said, "Thank You". As she walked away a wave of emotion came over me and I began to tear up. I looked down at the sash and it said, "Every Three Minutes". This is to signify that every three minutes someone is diagnosed with breast cancer. R saw this exchange and told me that there are people who pass these sashes out every three minutes throughout the entire event. She thought that it was very special that I had been singled out and as it turns out I was the only volunteer who received a sash. It is quite amazing to see so many women and men come together to walk 39 miles to raise money to help find a cure for this terrible disease. Most are walking for someone they know and love and there were over 200 survivors who did the walk as well. 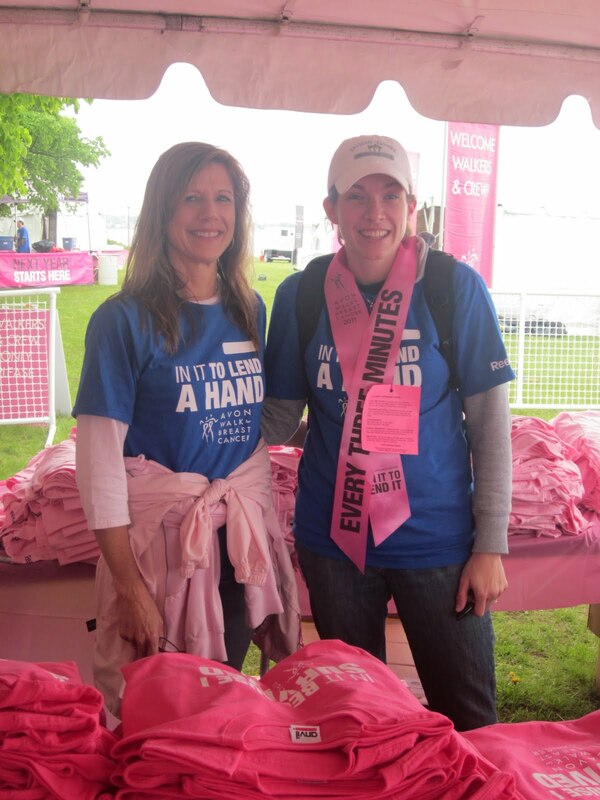 R and I handed out T-shirts to the walkers after they crossed the finish line and there were bright pink shirts for the survivors. Each time one of the women (and one man) told me they were a survivor, I said a little prayer for them, smiled and congratulated them as I gave them their special pink shirt. It was a very emotional day for me and one that I will never forget. I love you Kiki! I love that you were able to share your time for this special cause! I have goosebumps about the sash!